Who is it for? Mac Blue Brown Pigment is For those looking for a strongly pigmented loose powder that is long lasting and has a blue and brown finish to it. The Little MAC is a travel size product. The product comes in a plastic container that has the logo and the base of it has details like shade and quantity. The container comes in a zip lock bag, so good job with the packaging there. The only downside of the packaging is that the bottle of the container is very narrow, so getting the product out is a bit of a task…you sometimes end up wasting the powder. The minute I saw this product at the MAC store, I knew I would have to pick it up. It is such a beautiful, unique shade. Like the name suggests, it has shades of blue and brown. It looks different under different lighting and that’s pretty amazing! Also, it’s a shade that can be played up or down. It can be used for a sheer wash of color or it can be built up to give an intense pigmented look. 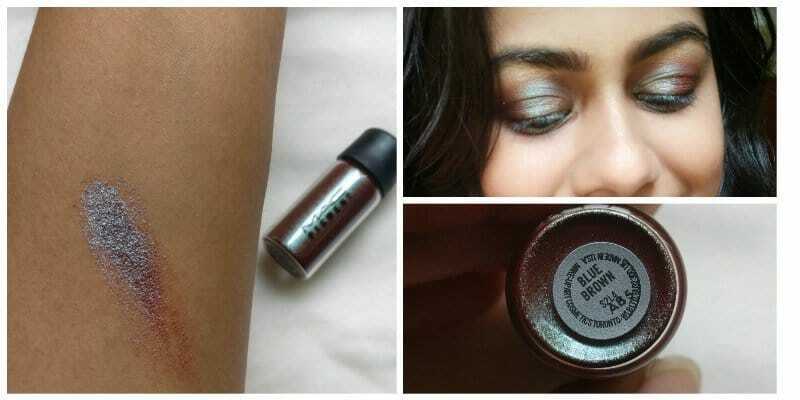 The texture of the Blue Brown pigment is very soft and smooth. Although it is in powdered form and looks granular, you can’t really feel the product. Since the texture is smooth, there is no problem with the application. It glides on with ease and is quite buildable. Now, in general, MAC products are expensive. And I’m sure most of you’ll agree. This product too is a little pricey…but, to be honest, it’s such a beautiful shade so I had no issue with spending on it. Like most other MAC products, this one too is long lasting. It stays on for hours without creasing. Yes, definitely. It’s a beautiful shade, so why not! MAC Melon Pigment is Dreamy!! !